Mushrooms are coming alive to save wildlife and help alleviate poverty in rural Thailand. FREELAND recently added ten mushroom barns to our newly constructed sustainable organic farming training center. Located in Wan Nam Keaw, just north of Khao Yai National Park, the training center is being used to help reformed poachers find sustainable and environmentally friendly alternative livelihoods. The new on-site mushroom barns will be used for training and exchange demonstrations. Their produce will also generate income to subsidize the cost of running the training center and outreach program. FREELAND has just begun to produce Yanagi mushrooms in addition to the more common Oyster variety. Please place an order for mushrooms or donate to support this project. June 10 update: Seven park protection officers and community leaders from Bhutan visited FREELAND’s sustainable agriculture training center to observe how ex-poachers are being trained and supported in starting alternative livelihood businesses. 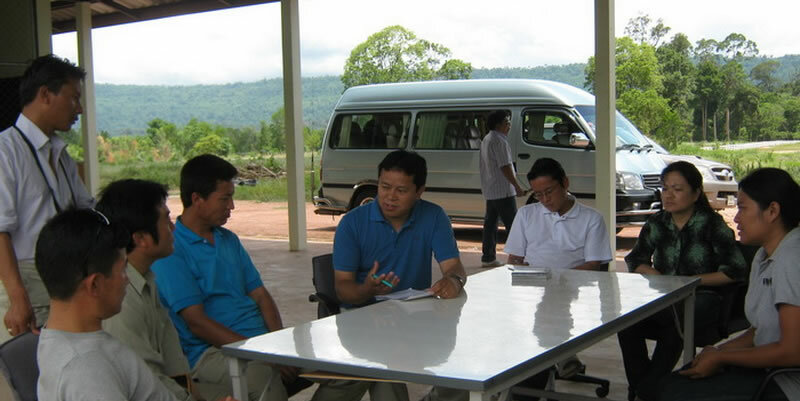 This follows study visits by women’s groups and community leaders from nearby provinces in Thailand during recent months. FREELAND hopes to promote project replication around other poacher threatened landscapes in Thailand and abroad through more study visits and exchanges.